Motorola has found out that they can not compete, so they are suing. Any other companies that legitimately have a case try to negotiate. Not Motorola. They can see that they are becoming irrelevant. Isn't that what you do in patent related suits? Firstly, you argue there is no infringement because the patents are invalid. Logically this is the best thing to do because if the patent is invalid there is nothing to infringe. Then you argue that your own device does not fall within the claims of the patent. Motorola are choosing not to wait for an infringement trial. I don't see what the issue is. You can read between the lines but they're essentially arguing what they would have done in any case. All very tiresome. The endless lawsuits are completely out of control. Everyone is suing everyone over the same stuff. If it wasn't so pathetic it would be funny. I was just thinking an info graphic of this stupidity would be handy and here it is.. Thanks mate. 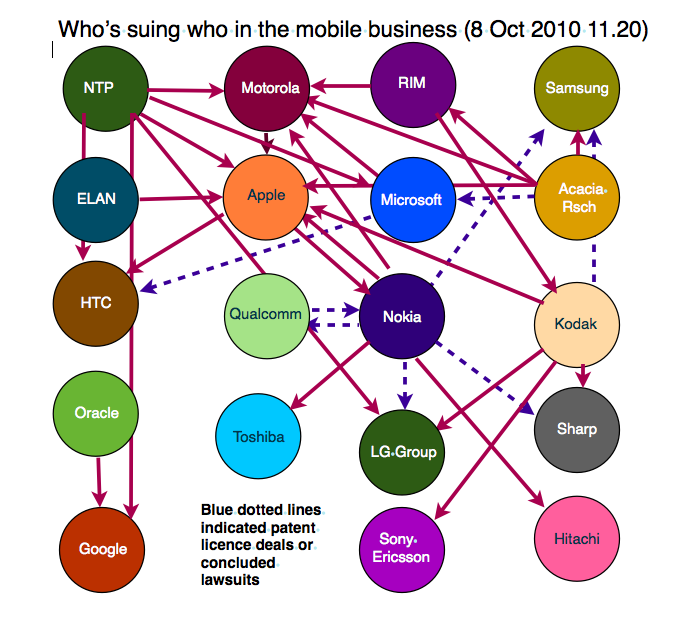 I reckon the mobile wars are going to have an interesting effect on the future of lawsuits and patents. There is no court with the technical capacity and historical knowledge to determine the validity in this mess. Most significantly all these cases are not based on infringement of IP, they are based on market share complaints (tantrums) that then look for excuses. Patents are getting ridiculous these days. Apple (and others) somehow think you can patent 'intuition' or 'structure'. And then sue some other maker that uses input methods, etc., which are similarly 'intuitive', or digital organization methods that are 'structured'. It's like McDonald's suing Burger King because Burger King puts a meat patty and cheese between 2 halves of a bun. I think Motorola will have a hard time suing around anything to do with Object Oriented graphics, as Apple and NeXT were using them before Motorola even knew what a mobile phone was. Is THAT what they're putting between that bun? I wondered what it was! These are very fundamental patents and I find it more than unlikely that they would succeed, but that they go the route of saying "this shouldn't be patenteed" versus "this is our IP and they used it", which is what they are doing with their other lawsuit. Motorola is probably still hurting over the fact that they could have been the iPhone maker. experience obviously triggered Apple's in-house development of the iPhone. breakup. Happens almost every time. Sounds more like Motorola wants to cross license with Apple and is trying to force them to the table. Good luck with that. Nice,have been saving that RAZR phone for years now, can resell it on ebay when they win!!! Going to Disney. Besides the 100 song limit the ROKR was a piece of crap phone. Motorola took an existing phone and tried to shoe horn iTunes on it. And you needed a microSD card to store the song on. The card and the SIM were held in place by metal tabs that broke off every few days. Zander tried to convince Steve Jobs that it was a "great" design. Thank god Steve did not listen to him else we would all be listening to music on a Wp5.5 phone. Huh? Motorola was in the cellular phone business long before Apple was, well, hardly anything. I always wondered about the ROKR. It seems to me that Apple forcing Moto to limit it to 100 songs would be more likely as it would keep it from hurting iPod sales. I see no reason why Moto would want that artificial cap. What argument and/or proof is there that Moto is the one that limited the number of tracks. The first cellular phone & cellular network. Back then, it was still analog, and Max Headroom was selling Pepsi to a new generation. But that was a long time ago. Back to the Future predicted we would have flying cars and hoverboards by the year 2015. Motorola obviously believe that Apple will sue them next after they finish with HTC. Apple v HTC is really a test run for Apple v Android and Motorola is betting big on Android. What we are seeing here is a preemptive move to disarm Apple before it goes after Motorola. I just wish all these firms would try to win by creating better products and not simply try to block the competition. Relax, nuisance patent lawsuits have no merit; they are just a form of trade negotiation, a kind of chess game played by corporate patent attorneys to justify their existence. The goal is to get the other side to either drop their suit or sign a cross-license deal. Either way, the attorneys make off like bandits.